This is an undeniably powerful production of David Harrower’s disturbing 2005 play written for the Edinburgh Festival after which it enjoyed a West End production, and a mounting by Manhattan Theatre Club directed, like the present production, by Joe Mantello and also starring Jeff Daniels. Scott Pask returns as scenic designer, and the stark set is as remembered, but the other production credits are different on this occasion but no less fine, with Ann Roth now designing the costumes, Brian MacDevitt the lighting, and Fitz Patton the sound. And it is now Michelle Williams rather than Allison Pill playing opposite Daniels in this taut two hander. 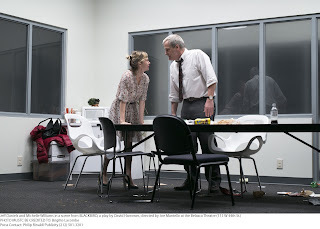 Whether it is her presence or perhaps a richer interpretation on the part of Daniels and a more experienced guiding hand from Mantello, but I found the play, in its present incarnation, even more gut wrenching than before. The setting is a break room in the office where worker Ray (Daniels) is employed. Una (Williams), a young woman from his past, has surprised Ray by tracking him down and showing up after coming across a photo of him in a magazine. Ray seems hugely discomfited by her sudden appearance, and has pulled her into this room out of sight of his co-workers. He seems anxious to move their reunion someplace outside the office, but Una is adamant about holding her ground there. Before long, revelations about a sexual relationship come to light, but to reveal more would spoil the neat and teasing construction of Harrower’s Olivier Award-winning work, one that never settles for easy judgments about either character. Suffice to say that both performers are at the top of their considerable games. Impressive as Williams was in “Cabaret” -- her Broadway debut -- she is even more compelling here, delivering a spellbinding and quite epic monologue, the sort of tour-de-force for which Tonys are awarded. And Daniels is equally splendid, the finely detailed nuances of his performance only fully evident by the evening’s end. Mantello directs the drama for maximum tension. There are lengthy stretches when you can hear a proverbial pin drop so gripping is the action and raw the performances.